This non-smoking room is on the 1st floor at the back of building overlooking the Scarborough Cricket ground.It has a double and a single bed, suitable for 3 adults.The room is en-suite (shower & toilet) with central heating, has a flat screen TV with Freeview and provided with tea & coffee making facility.Free WIFI is accessible in the room. Full English breakfast is included. This non-smoking room is on the 1st floor at the back of building overlooking the Scarborough Cricket ground.It has a double and a single bed, suitable for 2 adults.The room is en-suite (shower & toilet) with central heating, has a flat screen TV with Freeview and provided with tea & coffee making facility.Free WIFI is accessible in the room. Full English breakfast is included. This non-smoking room is on the first floor at the front.It is en-suite (shower & toilet) and has a double bed suitable for 2 adults.The room is provided with central heating and a flat screen TV with Freeview channels and tea/coffee making facility.Free WIFI is accessible in the room. This non-smoking room is on the first floor at the front.It is en-suite (shower & toilet) and has a double bed suitable for 1 adult.The room is provided with central heating and a flat screen TV with Freeview channels and tea/coffee making facility.Free WIFI is accessible in the room.Full English breakfast is included. This standard single non-smoking room is on the first floor at the front.It has a double bed for 2 adults.The room has a shared bathroom and toilet facility outside the landing.There is central heating, TV and tea/ coffee making facility.Free WIFI is accessible in the room.Full English breakfast is included. This standard single non-smoking room is on the first floor at the front.It has a double bed suitable for 1 adult.The room has a shared bathroom and toilet facility outside the landing.There is central heating, TV and tea/ coffee making facility.Free WIFI is accessible in the room.Full English breakfast is included. This non-smoking room is on the 2nd floor at the back of building overlooking the Scarborough Cricket ground.It has a double and a single bed for 3 adults.The room is en-suite (shower & toilet) with central heating, has a flat screen TV with Freeview and provided with tea & coffee making facility.Free WIFI is accessible in the room.Full English breakfast is included. This non-smoking room is on the 2nd floor at the back of building overlooking the Scarborough Cricket ground.It has a double and a single bed suitable for 2 adults.The room is en-suite (shower & toilet) with central heating, has a flat screen TV with Freeview and provided with tea & coffee making facility.Free WIFI is accessible in the room.Full English breakfast is included. This twin non-smoking room is on the 3rd floor at the front,It has two single beds for 2 adults.The bathroom and toilet are shared facilities outside the room on the landing. The room has central heating, a flat screen TV with Freeview channels and tea/coffee making facility.Free WIFI is accessible in the room.Full English breakfast is included. This twin non-smoking room is on the 3rd floor at the front,It has two beds but also suitable for 1 adult.The bathroom and toilet are shared facilities outside the room on the landing. The room has central heating, a flat screen TV with Freeview channels and tea/coffee making facility.Free WIFI is accessible in the room.Full English breakfast is included. This single non-smoking room is on the second floor at the front.The room has a single bed for one person.The bathroom and toilet are shared facility outside on the landing.The room has central heating, a TV with tea/coffee making facility.Free WIFI internet is access in the room.Full English breakfast is included. This family non-ensuite, non-smoking room is on the top third floor at the back of the building overlooking the Scarborough Cricket ground. The room has a double bed and two single beds for 4 adults.The room has shared bathroom and toilet facility outside the room on the landing and is provided with TV and tea/coffee making facility.Free WIFI internet is accessible in the room.Full English breakfast is included. The room has a double bed and two single beds suitable for 3 adults.The room has shared bathroom and toilet facility outside the room on the landing and is provided with TV and tea/coffee making facility.Free WIFI internet s accessible in the room.Full English breakfast is included. This family, non-ensuite, non-smoking room is on the top third floor at the back of the building overlooking the Scarborough Cricket ground. The room has a double bed and two single beds suitable for 2 adults.The room has shared bathroom and toilet facility outside the room on the landing and is provided with TV and tea/coffee making facility.Free WIFI internet is accessible in the room.Full English breakfast is included. This twin non-smoking room is on the top third floor at the front.It has two single beds suitable for 2 adults.The bathroom and toilet are shared facility outside the room on the landing.The room has central heating, TV and tea/coffee making facility.Free WIFI internet is accessible in the room.Full English breakfast is included. 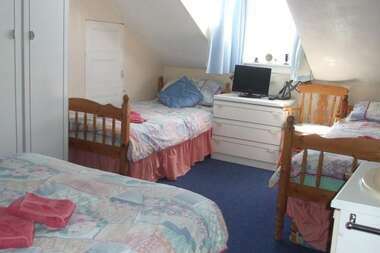 This twin non-smoking room is on the top third floor at the front.It has two single beds but can be suitable for 1 adult.The bathroom and toilet are shared facility outside the room on the landing.The room has central heating, TV and tea/coffee making facility.Free WIFI internet is accessible in the room.Full English breakfast is included. This single non-smoking room is on the top third floor at the front.The room has a single bed for one person.The bathroom and toilet are shared facility outside the room on the landing.The room has central heating, a TV with tea/coffee making facility.Free WIFI internet is accessible in the room.Full English breakfast is included.